I want to talk about a book that I have been reading. Basically the title gives the book away:) It's a collection of short stories written by and about the experiences of Ultrarunners. It's really great when you've only got a few minutes to spare. The stories are great and you get to know a bit about ultrarunners in the United States. 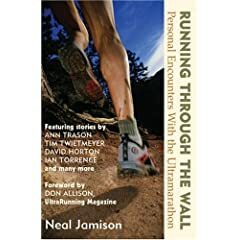 I think that it would be great to find a book about ultrarunners worldwide. I am still so amazed that there are so many people in this community! Once a Runner by John L. Parker. This book, if you're lucky enough to get your hands on a copy, is supposed to be a classic. I have come into a photocopied version of it... will report once I have read it.